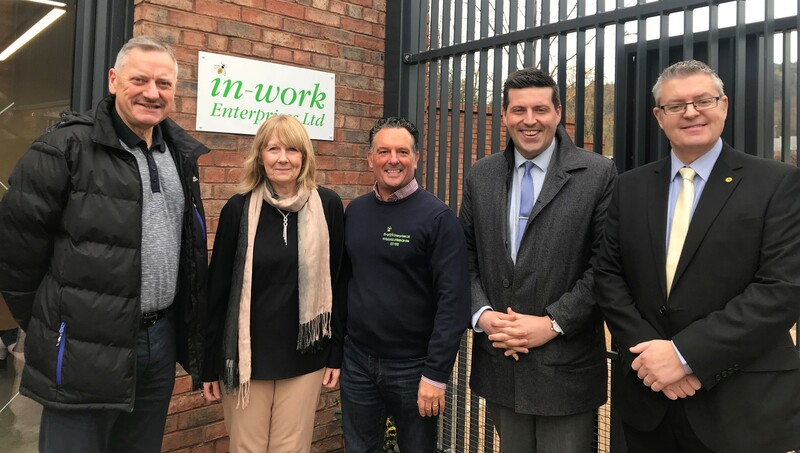 On Friday, the Minister for Business, Fair Work and Skills, Jamie Hepburn MSP, visited In-Work Enterprises Ltd at Broomhill Gardens and Community Hub at the invitation of Greenock and Inverclyde MSP Stuart McMillan. This was a result of Mr McMillan’s meeting with Margaret Tait, Chief Executive of Inverclyde Association for Mental Health, of whom In-Work Enterprises Ltd are a trading subsidiary. In-Work Enterprises Ltd are an established Ground Maintenance, Landscaping and Horticultural social enterprise business based at the Hub. Their aim is to help people recovering from mental health problems and/or long-term unemployment issues gain valuable training, skills development and work experience. During the visit, Mr Hepburn enjoyed a tour of the Hub and heard how In-Work Enterprises Ltd offer a unique work-experience scheme for those whom traditional employability programmes would not be conducive to meeting the additional challenges that many people face in their recovery and employability journey. “In-Work Enterprises offers invaluable work experience to people who may have enduring mental health problems which prevents them from taking on more traditional employability schemes. Learning landscaping and horticultural skills gets people out in the fresh air, which has proven health benefits, and gives them experience in an industry that will never go out of fashion. “It was great to meet with Stuart during the summer to discuss In-Work Enterprises and our plans for the future, and I’m glad that the Minister accepted his invite to visit the Hub as it was a pleasure to show him around and tell him about our unique work experience and training opportunities. “For people with enduring mental health issues, we provide an environment that focuses on their abilities and potential, which we think is crucial to enable participants to build their confidence and may eventually help them into the world of work. “We are mindful that for some individuals coming to our services, it is the first time they have experienced the discipline and responsibilities that are required to succeed in a work place. That is why we see it as essential for them to be provided with the time and space to settle into working, with no financial penalties or measurable outcomes looming over them. “I was delighted to see first-hand the valuable service In-Work Enterprises provides within the Inverclyde community.